Adding a pergola to your backyard is a fantastic way to create a more comfortable and attractive outdoor living space. A pergola is a shade structure that can be customized to provide the perfect amount of shade for your backyard. Pergolas consist of 4 posts with cross rafters to create shade. The further apart the rafters are placed, the more sun will shine through to your deck or patio. Here are 4 elements to consider when adding a pergola to your outdoor living space in order to ensure that you build exactly what you are looking for. The size of your pergola depends on the area you would like to cover. Consider what furniture or items you would like to place underneath. Because pergolas are open structures, they can define a space without separating the space. For instance, you could place your outdoor furniture under the pergola and keep your dining area outside of the pergola, defining your seating and dining spaces while keeping an open floor plan. Or you could build a pergola to cover both! Also consider whether you prefer to cover an entire space or if you would like to keep a portion of the patio or deck open to the sun. How much shade would you like? Many homeowners opt to cover only a portion of their outdoor living space rather than the whole area, that way they may choose to bask in the sun or relax in the shade. Keep in mind that the area under the pergola will not be completely covered by shade because the ceiling is not solid. This brings you to your next decision, how far apart to space the rafters. If you would like minimal amounts of sun plan to build the rafters very close together in order to maximize shade. If you prefer partial shade consider placing rafters farther apart. 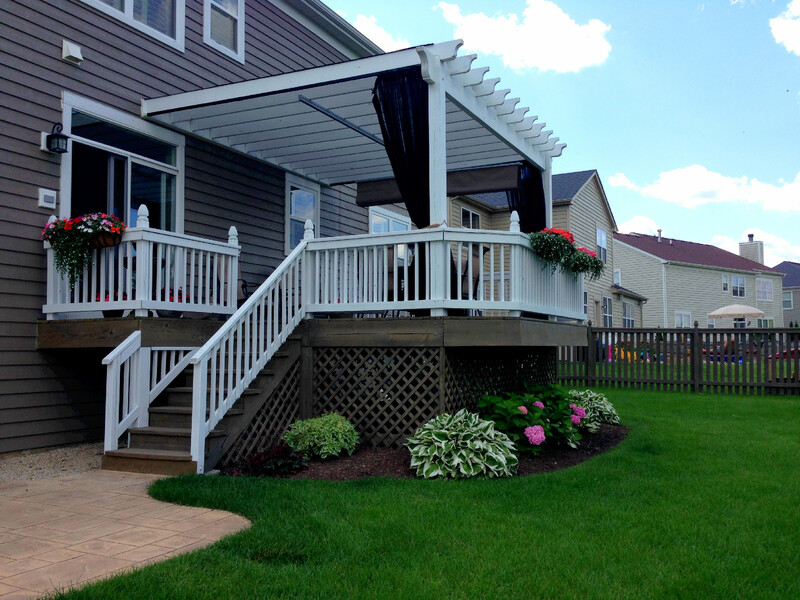 You can also increase the amount of shade offered by your pergola by adding a retractable canopy. Although the practical purpose of a pergola is to provide shade, don’t forget what a beautiful addition the pergola can be in terms of design and decor. How can you use your pergola as a part of your outdoor landscaping and decor? With flowers, plants, lighting, and curtains! Planting vines to climb and cover the pergola will create a romantic ambiance in your outdoor space while creating additional shade. Another option is to place hanging plants around the rim of the pergola. 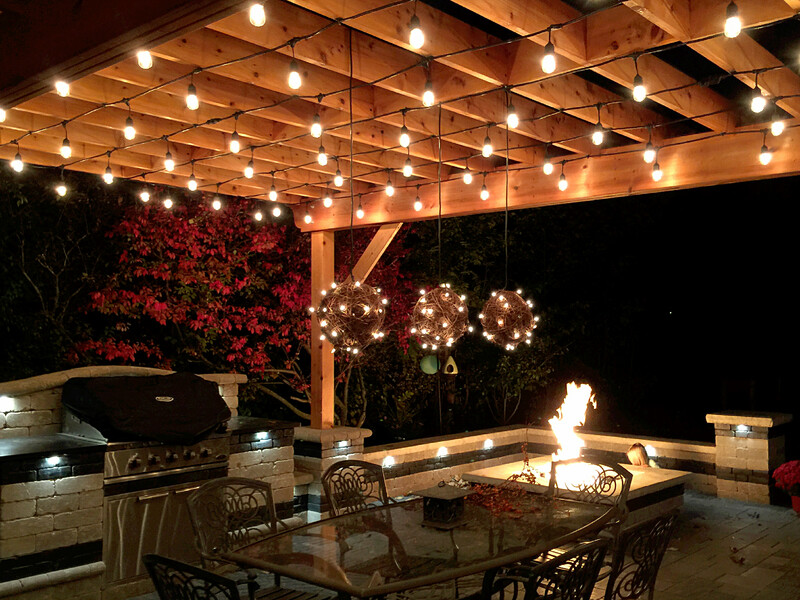 Outdoor lighting creates an intimate setting while allowing you to use the space long after the sun goes down. Mosquito curtains offer protection from pesky bugs and look gorgeous on any pergola. 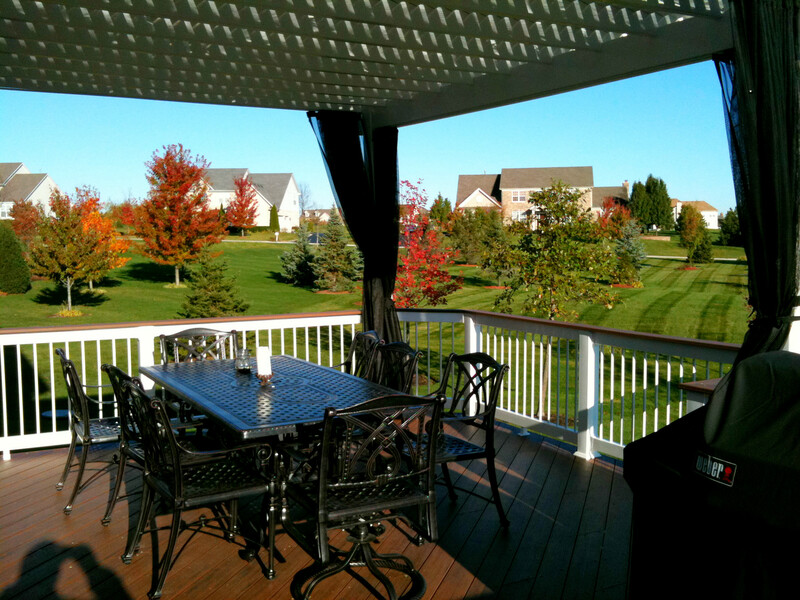 Our pergolas are customized to give you the optimal amount of shade as well as to decorate your outdoor living space. There are many design aspects to consider when building a pergola such as the material of the pergola, the shape of the posts, and the shape and spacing of the rafters. Would you like to create a perfect match to your house or add a unique pergola that compliments the style of your home? The options are endless. If you are looking for a way to change or spruce up an existing pergola, hopefully some of the tips in this article have given you some ideas to consider. Painting or staining, installing outdoor lighting, adding rafters for more shade, installing a pergola canopy, or hanging plants are all viable options. If you are looking for another practical change, consider mosquito curtains! This is a wonderful way to make your outdoor living space that much more enjoyable. Not only will you be protected from the sun while you enjoy the outdoors, but you’ll be protected from pesky mosquitoes and other insects as well. 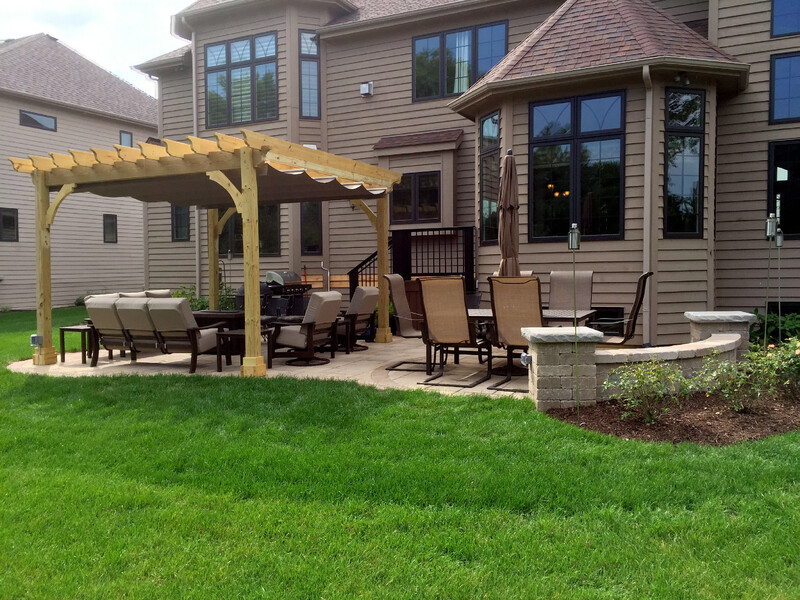 If you’re looking for a Chicagoland pergola builder to guide you through the design process and build your project, give us a call at (847) 496.4333 or sign up here for a Free Design Consultation.